Brid typically produced a set of markedly different days, with winds from very light to testingly fresh, and a range of sea conditions to work out. On Sunday, the surf left over from Saturday night's rain and squalls, coupled with very light breeze, prevented any boats getting on the water but a start delayed to 3pm let the building breeze punch the boats through the surf for two very brisk races, completing six in the long weekend. Race 1 started in light shifty easterly winds, where one mistake could lose you a number of places. The start line was heavily port biased, spotted by many of the fleet opting for a pin-end start at the pin end (photo below) but Stuart, John, and Chris took the more traditional starboard start with Stuart tacking onto port near the pin end as the class flag was lowered. The race was on as John crossed the fleet on starboard and they all passed behind him heading for the first windward mark. In these light airs it was essential to get clear air and John continued on starboard for 100 meters and then tacked onto port. Both Stuart and John sailed ahead of the fleet in clear air keeping the remainder at bay. Gareth was making good time following Stuart. As the windward mark approached there was some confusion, there were two yellow buoys. Which one was it? It became clear that the nearer larger inflatable was the one to head for. John tacked, his first major mistake and was too early and had to tack twice more to round the mark. Stuart over-stood the mark and rounded easily, an excellent decision as the next leg had turned to a beat to windward. Gareth rounded third behind John. The leg to mark 2 was hard fought between John and Gareth for second place with Gareth chopping at the transoms of 533, but neither could make ground on Stuart as got the boat in the groove and pulled away. The next leg, downwind toward the shore and the places at the front remained the same. John pulled away from Gareth, leaning over the front beam and using the waves to �surf� down the waves where possible. The reach to the next mark was Gareth�s territory where he reduced the gap and was again within touching distance of John. Meanwhile Stuart had rounded the mark for the start of the next lap and was sailing high straight for the buoy, John and Gareth could not match him as he seemed to have his own personal wind. John managed to put some distance between him and Gareth on the next 2 legs but was in danger of being passed on the final reach to the finish. Race two followed back to back, in sunshine and a light breeze. The line favoured the traditional starboard end (photo below) and John Terry aggressively dived from upwind through the tiny gap left between the committee boat and the other starters inching forward, to get away at speed for a useful lead. Gareth's usual preference for a start at speed further down the line got him away well, to build a lead held to the finish, ahead of John over the two laps. By now the fleet was familiar with the rhomboid course, which with the wind swinging had virtually two beats, with a premium on upwind boat speed, suiting Syd Gage, coming past to take fourth behind Stuart. Sunday dawned overcast and drizzling with a light north-westerly The overnight wind and rain had kicked up a long swell, and it was clear that no boats would get out through the surf. The fleet relied on the forecast building of the breeze and by 3pm could crash out through the surf on a fresh northerly. The increasing wind kicked up a steep chop over the top of a swell from the east giving taxing conditions, and keeping boat speed particularly into tacks became the key tactic. After a long delayed start for Race 3 with the committee boat dragging its anchor, the fleet was away tightly packed at the starboard end. John Terry luffed Stuart on the line forcing a 360', and then was away fast on trapeze building a good lead, held to the finish. Gareth headed lower for speed and gradually pulled away from the rest of the fleet for the second place. George and Alastair were close round the first lap until George shot away on the second reach to hold a comfortable third. Round the next lap, Stuart and Alastair stayed very close until Stuart had the reaching speed on the final leg for a close fourth. At the Race 4 start, Stuart led from Alastair on a heavily port biased line, for good gain over the rest of the fleet on starboard, but it took them out to the right, and the starboard starters carrying on nearer the shore gained, so that John (again going fast trapezing) and George crossed ahead when they converged at the windward mark. John stretched out and George eked out a a more comfortable second place lead. Stuart and Alastair stayed very close for the second beat. Stuart turned quickly to head to the left but this time it appeared not to gain and Alastair had a useful third place lead, extended over the final reaches and run. Ahead, George was pulling steadily up on John but unable to catch him. Behind Syd came steadily through, and Chris recovered from a dunking climbing back in the upright boat to follow him in.Family commitments took Gareth out of the equation, and the fleet grabbed the chance to move up a place. The prospects for Monday racing were threatened by forecast light winds, due to fall further, but a good decision to go let two back-to-back races be completed in light westerlies, in sunshine. The surf was down but the easterly swell was still there, opposing the smaller chop, with the upwind challenge that the swell lifted the boats to windward as it rolled under them, with the apparent breeze see-sawing back and forth.The sail out to the start line took an age, but the race officer had judged it perfectly with the winds starting to pick up with some heavy clouds bringing in a good breeze. Stuart and John tussled for the favoured committee boat end on the Race 5 start line, and Gareth came through strongly below both, taking the lead as Stuart took a penalty turn. George was hot on their heels. John opted to tack early toward the shore with George and Gareth heading out off shore. The fleet tacked inshore and John tacked to cross them. The wind was shifting and bending towards the shore, heading those on port tack approaching the shore. Gareth kept on towards the shore with George tacking back to the east, the rest of the fleet well off-shore. This pattern continued until the windward mark with Gareth well ahead after finding his own strong breeze along the shore, for an unassailable lead at the windward mark, followed by George and then John. 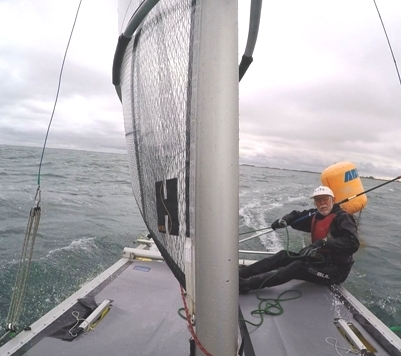 A very tight reach to the next mark, with variable winds giving lifts in the gusts, let good gains be made, and John got past George on the back of one of these gusts to round in second place, but George was past again on the next long run. 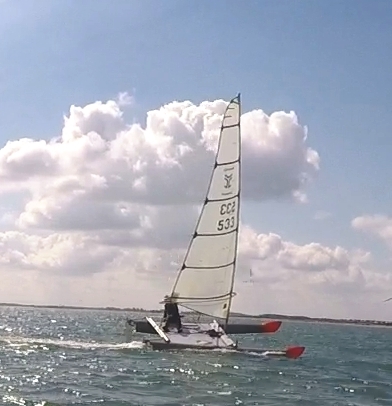 On the next short reach John and George were neck and neck, mixing it with a few of the Dart 18 fleet. Rounding the mark, George in the lead, John headed for the shore, George tacked off. The winds now were strong enough to trapeze but John had left his harness ashore so a lot of hard hiking was required. Taking the shore route paid off and John arrived at the windward mark ahead of George. George pushed John hard all the way to the finish, but could not repeat the gains he made on the previous downwind leg. Behind, Syd took the fourth, followed by Stuart, Alastair, Chris and Damien. Race 6 started on a short start line in a light but sailable breeze. Stuart, wary of a last-minute lull, was early to the line and reached down it on starboard to eat up time, only to confront John Terry attempting a port-end start. The resulting tangle at the outer pin saw Stuart just touch the mark and John caught on port, both beginning the race with 360's. Meanwhile, a right shift had favoured the starboard end boats and George Alastair and Damien streamed away to the left. In turn Stuart John and the rest of the fleet went right down towards the shore and further shifts put them back. Out on the right, Alastair and Damien tacked down the middle pursued by Gareth, but George kept on to the far left meeting fresh breeze and lifts, and building an enormous lead, kept round the two laps to the race end. Gareth and the John pulled up through the fleet on the second (final) lap, for the second and third, with Alastair holding fourth. Damien, having enjoyed being ahead of both Gareth and John for a good spell, came in sixth ahead of Stuart. Brid had again delivered a variety of breezes, and open sea conditions to grapple with (including some surfing to windward) With the good racing (including some aggressive starting encounters) four different helms shared out the first places, but John Terry and Gareth Ede were consistently fast, and John came home first by one point, retaining his grip on the Northern Trophy.